CD with a live recording of Anton Bruckner's "Symphony No. 6" with the Symphonieorchester des Bayerischen Rundfunks and Bernard Haitink of 4/5 May 2017 from the "Philharmonie im Gasteig" in Munich. For a long time, Anton Bruckner’s Sixth Symphony (together with his Second) was regarded as something of a ‘poor relation’ in his immense symphonic oeuvre, even though the composer himself had moodily referred to it as his “boldest”. Over the decades, in view of its performance figures and recordings, this has changed significantly: The work has now secured itself a permanent place in the repertoire. The Sixth Symphony belongs to the creative process of the two preceding symphonies, the “Romantic” Fourth (1874/1880) and the Fifth (1875), and is now seen as an important preliminary stage in Bruckner’s last great upsurge that followed the composition of the “Te Deum” (the initial sketches of which date from 1881), and culminated in the sublime grandeur of his final symphonies, the Seventh, Eighth, and Ninth. The “very solemn” Adagio of the Sixth Symphony, in particular, provided the model for the famous Adagio of the Seventh Symphony that followed it. Bruckner worked on his Sixth Symphony in A major (WAB 106) from September 24, 1879 to September 3, 1881. During his lifetime, he was only able to hear the complete work at one orchestra rehearsal, because only the two middle movements (Adagio and Scherzo) were publicly performed in the concert hall of the Vienna Musikverein on February 11, 1883. The first public performance of the symphony in its entirety followed only on February 26, 1899 – two and a half years after the composer’s death. It was conducted by Gustav Mahler, who, however, had made changes to the score and presented it in a radically shortened version. 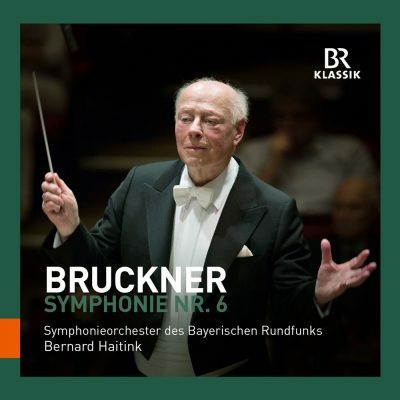 Bruckner’s first-hand version was heard for the first time in Stuttgart on March 14, 1901, and it would take until October 9th, 1935, for the Sixth Symphony to be first performed as Bruckner’s original score prescribed. The recent Munich concert performance of May 2017 has now been released on CD by BR-KLASSIK. This outstanding interpretation of one of the key compositions in the Late Romantic symphonic repertoire is conducted by Bernard Haitink.